What is the story behind one of the greatest archaeological discovery of the 20th Century — the Dead Sea Scrolls? Dr. Fleming: In the winter of 1946-1947, a Muslim shepherd boy of the Ta'amireh tribe was with his goats and one of them went up into a cliff. To get the goat to come down, the boy tossed a rock into the entrance of a small cave. The rock went "clunk" instead of "clack." It hit something hollow. Being curious, he went up inside, and sure enough there was this tall pottery jar that had been broken. Inside the jar he thought he would find gold, but instead he found this dirty, blackish, rolled up leather which we now realize was animal skins. Some of the skins were sheep and some even cow skins. The boy put three of the skins into his satchel and carried them back to the head of his tribe because he thought maybe they could be sold or used for leather in making shoes. The tribal head went to a shop in Bethlehem. Listen to the providential name of this shop: Kando's Shoe and Antiquity Shop. Thank the Lord, because Mr. Kando noticed faint Hebrew letters on the backside of the scrolls. Wouldn't it have been amazing having Bedouin wearing Dead Sea Scroll sandals if they hadn't been properly found? They weren't even sure on the significance of them. This was right at the eve of the War of Independence between Israel and the surrounding Arab nations. Mr. Kando was a Syrian Orthodox Christian, so he gave them to his Archbishop who was going to go to the U.S. and thought maybe they could be sold because the community was really needing help financially. Later an ad appeared in the Wall Street Journal, "Dead Sea scrolls for sale, would make an ideal gift to your church or college." Fortunately, a scholar saw the ad and reported it to Yigael Yadin, the son of the famous archaeologist by the name of Sukenik, who arranged to buy them through an intermediary. They would be going to some Jews at the time, and so most of them ended up in the Israel Museum in Jerusalem. What a fascinating save! Nathan Jones: Did they know what they had found? Dr. Fleming: Once photographs were taken of some of them, they were sent to a famous American, actually the Dean of Archaeology in the United States, William Foxwell Albright. He looked at the pictures and sent back a cable to Jerusalem, "Congratulations on the greatest manuscript discovery of our century." There can be no doubt as to their authenticity. I would guess by the script they are about mid-First Century AD, which is exactly on target. Dr. Reagan: Were additional scrolls found? Dr. Fleming: The same tribe thought they could make more money, so several more caves were found. They are numbered by their sequence of studies. Eleven caves ended up with scrolls in them, but Caves 1, 2, and 3 produced these first ones that were mentioned by that identification by Albright. 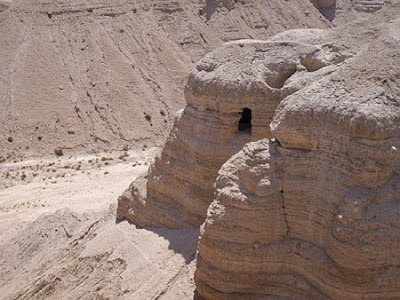 Cave 4 (below) was actually found after an excavation of the closest archaeological site which is Qumran. Cave 4 is the one most commonly pictured. It contained scrolls that were not in jars, and so they ended up being in 40,000 pieces. Dr. Reagan: I also understand that when it became known that these scrolls were valuable that the Bedouins began to tear them into little pieces. Dr. Fleming: Yes, they found they could get more for them. In their ignorance these first scrolls were sold for peanuts at the time. Dr. Reagan: Now, were all these scrolls of biblical text? Dr. Fleming: About one-third, and altogether there were almost 1,000 scrolls, and many of those only small fragments remained. Of the 1,000 original scrolls, a third were Hebrew Bible Old Testament text. Nathan Jones: Minus what, two books, right? Esther and Nehemiah wasn't it? Dr. Fleming: Yes, but that is a little bit tricky because a couple books tend to be like First and Second Samuel on the same scroll. A part of First and Second Samuel was found, but the piece was only from First Samuel, right. Nathan Jones: So, these are Old Testament books then that were discovered, what, hundreds of years before our existing copies? Dr. Fleming: These all are from about the Second Century BC. Qumran was destroyed in 69 AD. Dr. Reagan: Now, explain, what is the significance of finding scrolls that old. Dr. Fleming: We had to just trust that the Jewish scholars, called the Masoretes, did a good job discerning which of the old scrolls that they had in the 800's AD were more accurate. Dr. Reagan: So, you are saying the oldest scrolls we had before this were dated to 800 AD? Dr. Fleming: No, of the various scrolls we had in 800 AD, several scrolls probably went back to almost the First Century. But, because copying errors were in some of them, they didn't want any of those to be copied, so after they determined which they felt were the more accurate the others were not destroyed, but buried, so none survived until this discovery. 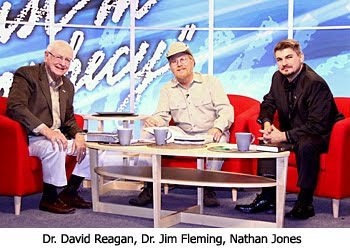 Dr. Reagan: So, the discovery of the Dead Sea Scrolls took us back 800 years? Dr. Fleming: Some of the scrolls, one at Qumran is probably from 300 BC, are between 800 and 1,000 years older. Dr. Reagan: Were there any complete books of the Bible found? Dr. Fleming: Almost complete, and only a few words were missing in a few. The three most common books, for which they needed more copies because they were used more frequently, are the same three that Jesus quotes most often from: Isaiah, Psalms, and Deuteronomy. Those were felt to be of more practical use and therefore more synagogues had them. 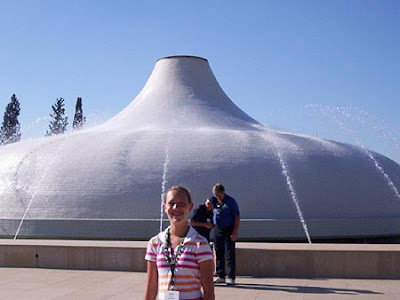 Dr. Reagan: The copy of the Isaiah scrolls is the centerpiece of the Dead Sea Scrolls Museum (below). Dr. Fleming: Yes, and between a dozen and 15 copies were found of those three. Dr. Reagan: What else besides Hebrew texts were found there? Dr. Fleming: About one-third were inter-testamental books that we already knew about. This would be First and Second Maccabees, Jubilees, and some other books together know as the Apocrypha today. These were not felt to be as old as the Hebrew Bible books, therefore they were not chosen by the Jewish scribes to be part of what they consider the Canon. Nathan Jones: How did they all get in those jars? Dr. Fleming: They were hiding them on purpose for preservation. They hoped they could come back after they temporarily hid them in those caves. The final one-third were documents procured by the community that gave us the texts. We had no idea of them before this discovery. They were commentaries mostly. There was one called the "The War of the Sons of Light Against the Sons of Darkness." Dr. Reagan: Were there writings on rules and regulation? Dr. Fleming: Yes, "The Manual of Discipline," or "The Rule of the Community."